An Ghaeltacht Bheo: Anois ‘is Go Deo! 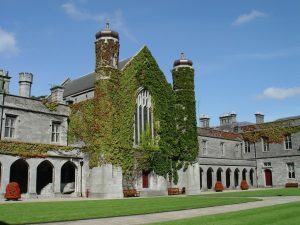 Bíonn MISNEACH ag eagrú feachtas litreacha agus r-phost chun brú a cur ar Roinn na Gaeltachta i mBaile Átha Cliath a gcúram maidir leis an teanga agus leis an nGaeltacht a chomhlíonadh. Bíonn muid ag agóidíocht lasmuigh agus laistigh de chuid foirgneamh s’acu chomh maith chun an méid is mó brú agus gur féidir a chur orthu. Le deireanas, agus i ndiaidh dúinn dul i gcomhairle le muintir na Gaeltachta féin, bheartaigh muid ar thacú leis na Coistí Pleanála Teanga atá ag stocaireacht ar son an maoiniú chuí a fháil chun go mbeadh oifigigh fostaithe acu chun tabhairt faoi na pleannanaí teanga mar is ceart. Tá baill MISNEACH gníomhach sa Dream Dearg atá ag feachtasaíocht ar son Acht Teanga sna Sé Chontae faoi láthair. 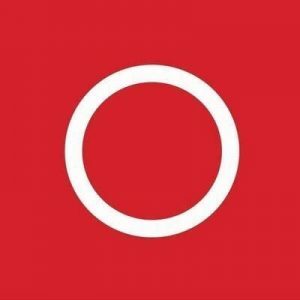 Tá an Dream Dearg ag dul ó neart go neart ó d’éirigh leis cinntí mailíseach na n-Aontachtóirí a throid áit a raibh baol go gcuirfear deireadh leis an scéim Líofa agus go ndúnfar clubanna óige Gaelacha in Iarthar Bhéal Feirste. Tá an tAcht le buachaint go fóill, áfach. Tá baill Misneach le tamaill anois ag freastal ar chásanna cúirte an chomhairleora Diarmuid Ó Cadhla atá os comhair na cúirte sna Sé Chontae Fichid mar gheall ar scrios a rinne sé féin agus Feachtas Comharthaí Chathair Chorcaí ar chomharthaí a bhaineann leis an mBanríon Shasanach Victoria. Agus é ag tabhairt faoina chás a chur faoi bhráid an bhreithimh, diúltaíodh dó an plé a dhéanamh trí Ghaeilge. Tá Misneach ag faire go géar air seo agus beidh muid réidh le linn 2018 dul i mbun agóidíochta ar an gceist, más gá. 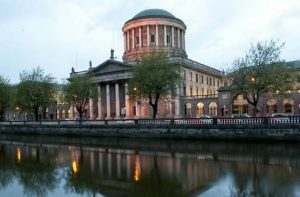 Ollscoil Dhátheangach nó Ollscoil frith-Ghaelach? 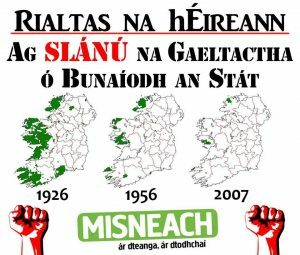 I nGaillimh bhí MISNEACH ag stocaireacht chun brú a cur ar Ollscoil na hÉireann Gaillimh riachtanas Gaeilge do phost an uachtaráin s’acu a choimeád agus ceapachán a dhéanamh ar Ollamh le Gaeilge mar cheann roinne ar Scoil na Gaeilge. Bhí áthas orainn le linn 2017 nuair a baineadh amach an dá aidhm sin. Ach tá neart le déanamh ag an Ollscoil go fóill. Feachtas i leith Facebook: feachtas buaite! 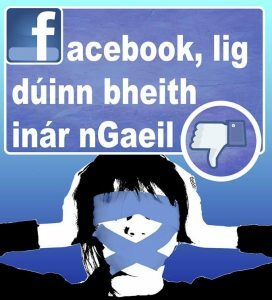 Le linn 2014 d’éirigh le MISNEACH brú a chur ar Facebook chun go n-athróidís a bpolasaí i leith ainmneacha ‘bréagacha’. Bhí an comhlacht meáin shóisialta ag dúnadh cuntais Gael de bharr nach raibh ainmneach ‘cearta’ acu. Tá éis agóid a bhagairt bhuail baill MISNEACH le feidhminnigh Facebook agus réitíodh an fhadhb, rud a d’fhág go raibh toradh dearfach ann go domhanda agus leasú déanta ag an gcomhlacht ar a bpolasaí i leith ainmneacha grúpaí mhionlaigh eile ar nós Bundúchasaigh Mheiriceá, lucht na Gáidhlige agus an pobal LGBT.